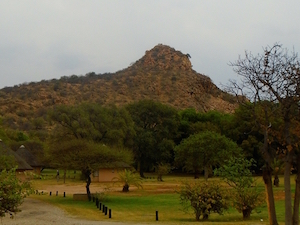 Just a stone’s throw away from the Kruger National Park lies the secret meeting place of the giants. Where the Tshipise koppie towers majestically over the little oasis like an ancient watchman. 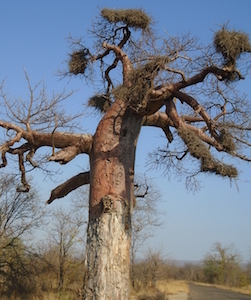 Giant upside-down baobabs dot the surrounding bushveld like lone pilgrims en route to a solemn meeting place. As you enter Tshipise, A Forever Resort, the tranquillity enfolds you like a snug blanket. It is a place where you can rest from life’s burdens. A place where you can take the time to reflect on where to go from here, or just spend some quality time with the wife and kids, or enjoy a sunset adventure. One of the sweetest pleasures was watching the nyala foraging for food a few steps from the rondavel. Meerkat troops scurrying around, so close I could almost touch them. 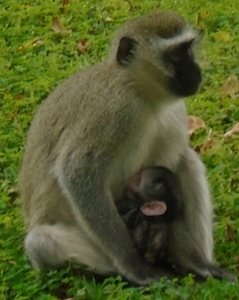 Enjoying a steaming cup of coffee on the step while monkeys entertained us with their antics. Watching the sun gently kiss the resort like a Prince Charming his Sleeping Beauty. When the sun set later in the day, you could hear lions roaring their superiority as king of beasts from ranches up to five miles away. Simply soak your aches and cares away in the rheumatic bath. Feel rejuvenated and refreshed. You’ll be ready to face life’s challenges again! This pool contains at least 10 different minerals. During October the temperatures at the resort reach up to 40˚C, so drink lots of water with a refreshing dash of lemon to prevent dehydration. And don’t forget the sunscreen. Although there is lots to do at the resort, such as discovering nature on horseback (I never seem to get the rhythm right), game viewing trips at night, putt-putt, etc., we chose to take an afternoon trip to the Pafuri Camp in the Kruger Park. The dry bushveld almost felt mundane, yet strangely peaceful as we gobbled up the 64 miles to the park, having to sidetrack the road due to its being partly washed away earlier last year. We were richly rewarded for our patience. Scattered small herds of impala lazily grazing, a shy warthog, eland, a herd of pyjama-clad zebra, nyala, and water buffalo climbing the opposite riverbank — all made a guest appearance as if we’d ordered it. We almost missed seeing the elephant as we hightailed it out before being locked in the park overnight and potentially becoming lion food. The Tshipise resort boasts the following facilities: butchery (their meat is really good), laundromat, restaurant, coffee shop, general store where you can buy a whole gamut of things from camping gear to food to swimming costumes, and Wi-Fi. To book your rondavel and experience the meeting place of giants firsthand, call the friendly people at Tshipise by dialing +27 15 539 0634, or alternatively you can contact them at http://www.forevertshipise.co.za. Pensioners get a discounted rate. From the OR Tambo International Airport in Johannesburg, it is a six-hour trip by road. Take the N1 North to Polokwane. Take the Tzaneen off-ramp and continue towards Musina. After the Baobab tollgate, take the R525. The entrance to the Tshipise resort will be on your right. Pop in to Popallin Ranch for an educational day trip. They have a white lion breeding program, and if you’re fortunate enough to visit on the correct day, you can actually watch them feed. But that’s not the only attraction. Their tented gym is a must-see — it features a giant baobab large enough to form one wall. To me the real highlight of the ranch was enjoying lunch on a raft as crocodiles lazily watched us. Curious but shy hippos would disappear underwater before we could come close to take pictures. A pied kingfisher proudly stood guard under the bridge, pretending not to see us. The best part? Being in two countries at once, as the Limpopo forms the border between South Africa and Zimbabwe. Bookings can be made at http://popallin.co.za/bookings.html.